Simply Back to Basics: Stuck in the Maze?? At some point in our lives, we all become stuck. For all kinds of reasons. Some of us stay stuck for a short time, a few minutes, a few days, weeks or months, some of us for years. Some are stuck with emotional stuff, some with physical, but dealing with it has to happen inside first. In my organizing business, I don't just reorganize clients' stuff--- I reorganize their brains!! This is so important to lasting change. 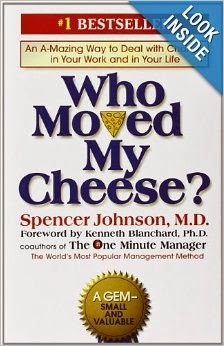 One of my favorite books about dealing with Change is "Who Moved My Cheese", by Spencer Johnson, MD. As the inside cover states "Written for all ages, the story takes less than an hour to read, but its unique insights can last for a lifetime." The book is about 4 characters, two humans; Hem & Haw, and two mice; Sniff & Scurry, who all live in the maze. Each day they go to Cheese Station C where they find "Cheese". Cheese is a metaphor for what they want in life; happiness, power, money, success, family. The humans become complacent in their Cheese and begin to take it for granted while the mice continually look around them and anticipate change. When the Cheese in Cheese Station C starts to dwindle, they are not surprised and they begin to prepare to change. The humans, ignore the signs and one day when no more Cheese is left, the mice quickly run back into the maze to search for more cheese, but the humans, being caught up in their analytical ways, with their complex brains, resist the idea that change is needed and continue to search for the missing Cheese in Cheese Station C. They even dig out the wall and try to find it. Haw finally begins to see the "Handwriting on the Wall" and the futility of their behavior and he tries to convince Hem to go out into the maze and search for new Cheese. Hem is absolutely stuck. He is terrified to make any changes. He won't even look out into the maze for alternatives, despite Haw's pleading. Haw is indecisive and asks himself "What would you do if you weren't afraid?" Finally he decides that change is essential to his survival. He simply cannot get different results unless he makes a change and takes a risk. Which he does. Meanwhile, Sniff & Scurry, who were not hampered by the humans' complicated analytical brains, have long ago found new Cheese in the maze at Cheese Station N. When Hem decides to take a risk, he learns so much about himself AND he learns to laugh at himself and some of his self-limiting ways. He even goes back to encourage Hem, but Hem is unwilling to change and so Haw reluctantly goes on without him. Finally, Haw arrives at Cheese Station N, where Sniff & Scurry have found an ample supply of New Cheese. Despite the seemingly endless supply and variety, all three continue to keep noticing things around them and preparing for change so that when they need to, they can deal with it. What happens to Hem? Well, he is still stuck.... or is he? Read the book to find out; hard copy or kindle. Also, here are links to a great (10 minute) movie on YouTube based on the story and a brief Power Point for additional ways to understand and experience this life changing parable. While my story is a brief summary, these two links will give you all the depth and insight that is woven into "Who Moved My Cheese?" For help, simply call Linda, 716-631-5619.